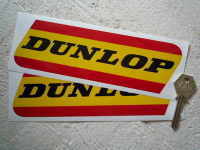 Dunlop Motorsport Cut Letters & Red 'D' Logo Stickers. 10" Pair. 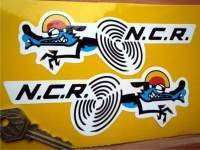 A pair of cut vinyl Dunlop Motorsport stickers. 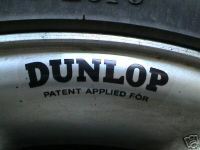 These stickers have no background to them, so that when applied using the pre-fitted application tape, just the Dunlop letters and D logo remain (i.e. 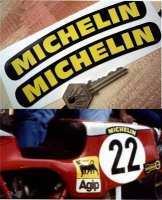 the black in the picture is not part of the sticker). 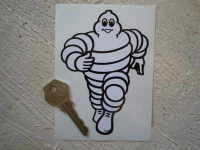 Available in either Black (with red D), Silver (with red D) or White (with red D - as pictured). 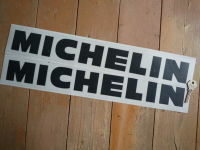 Each sticker measures approximately 250mm by 40mm. 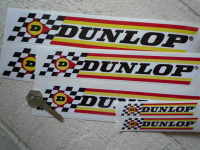 Dunlop Red & Yellow Classic Stickers. 5" or 7.5" Pair. 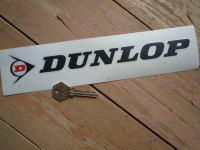 Dunlop Cut Letters & Red 'D' Logo Stickers. 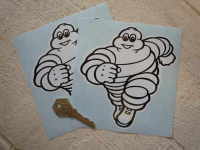 6", 8" or 10" Pair.